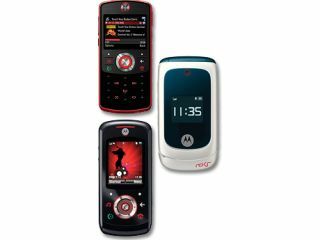 Motorola…where did you go? One moment the RAZR was winning awards, and being the darling of all the media's collective eyes, and the next…it's spitting out mid-range phones and hoping people love it again. The company has released three mid- to low-end phones in a bid to boost the ROKR range (the one that spawned the E1 iTunes phone in 2005…why, God, WHY?). The first, the EM30, is the closest in appearance to the recently released E8, with the changing keys on the candybar design flicking between music and phone stuff. Using high-speed connectivity and Motorola's CrystalTalk, the device comes with a 3.5mm headphones jack, making it a 'proper' music phone. A 2MP camera and expansion up to 8GB through microSD make this the best of the pack…which isn't saying a huge amount. The next up, the EM28, is a clamshell with touch sensitive media buttons on the front display for media control. Connectivity comes through the EDGE network, with around 250 mins music playback. A boring 1.3MP camera and expansion up to a paltry 2GB make this a phone for those on a budget but still want fancy controls. The final handset, the EM25, is a slider with standard GSM connectivity. Coming in with a similar 2GB capacity to its clamshell brother, at least this one packs in 11 hours of music playback. Also present is a 1.3MP camera, with FM radio recording and the 3.5mm headphone jack. The handsets are designed for a global consumer base, and will be hitting the shelves later this year, so try and contain your excitement for a little while.